Some marketers live on islands. They sit alone, putting marketing messages into bottles and throwing them into the sea, hoping something will come back. They’re isolated. Stranded. Other marketers have discovered one of the great secrets in content marketing. They’ve learned about collaborative content marketing. They include others in their work. They reach out and gather quotes. They share. They work together. Influencer marketing? Blogger relations? Modern-day PR? This strategy has many names. Whatever you call it, it’s becoming a more important, more popular tactic in content marketing. 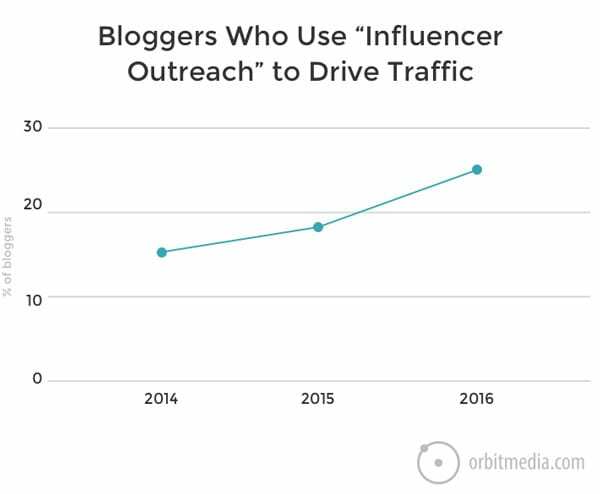 According to our most recent survey of 1000+ bloggers, almost 1 in 4 bloggers is doing influencer outreach. That’s a 40% increase over the last two years. Before we dig in and learn how to find these key influencers, let’s define the term. What’s influencer marketing? And is it effective? Influencer marketing is focused on the key people who have already built the audience you want to reach. The goal is to connect with these influential people and collaborate, allowing you to borrow that audience in a sensitive and considerate way. Collaborative: Is this person likely to work with me? Will this person respond if I reach out? Are they likely to accept my invitation to collaborate? Will they look for compensation? Relevant: Will it be an effective collaboration? Is this person known and trusted by my audience? Are they likely to share or promote content we create together? Are they a writer? Do they create content in my niche? Social is temporary. Search is forever. 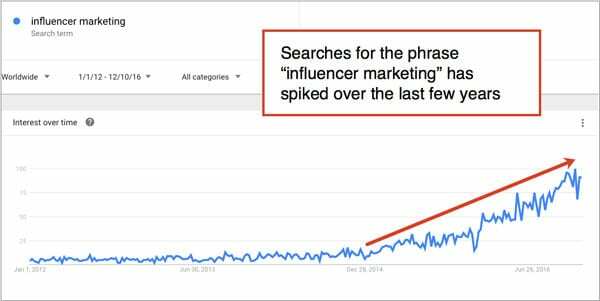 If you’re interested in the SEO benefits of influencer marketing, that last question is very important. People who create content also create links. If they do eventually mention you in their content, it may help increase your domain authority and rankings. These are seven types of influencers who create web content beyond social media posts. If a social media influencer shares your content, the benefits are very short lived. The lifespan of your content in their social stream can be measured in minutes. If it does give you a traffic boost, it will be over before the day is done. If a content creator mentions you on their website, this has a more durable benefit than a share on social media. That mention (and link) passes a bit of authority from their website to yours. And it’s this authority that helps your website rank. Warning! Paying people to link to you for the sake of search engine rankings is a violation of Google’s Webmaster Guidelines. This is a kind of “link spam” and it’s both unethical and risky. Influencer marketing is first and foremost about people, not links. Content creators who are influential within your niche are easy to find. That’s because social media is the world’s greatest phone book. First, we’ll find influencers using a free tool for searching social media profiles. Then we’ll use a more powerful paid service, BuzzSumo. Now you’ll be looking at a list of people who are likely influential within the niche. They’re sorted by the size of their followings. More followers usually means more influence and reach, but not always. It’s easy to get lots of followers without influencing anyone. So also look at the Social Authority column. This number combines followers with other metrics like number of tweets and influence of followers. 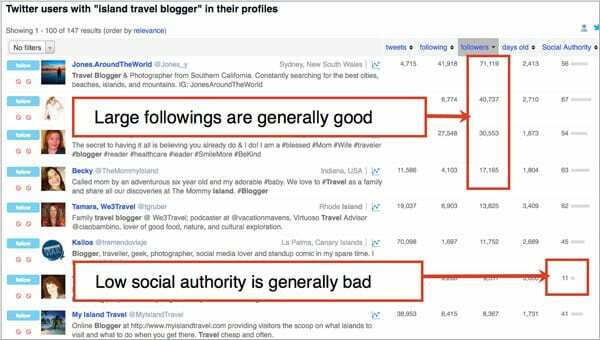 Low authority means the account is less likely to engage and drive traffic. Dig deeper into the accounts that look interesting. Are they sharing lots of content? Are they interacting with other people? Are they active on other networks? When you’ve found a few winners, add them to your list of people to reach out to and collaborate. You can also export your list into Excel. 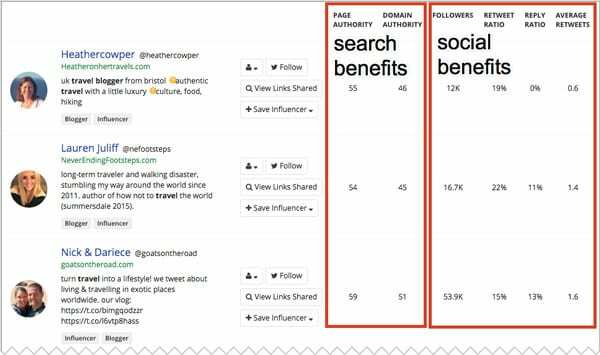 There are a lot of paid tools you can use to find influencers and track your interactions with them. These tools have excellent search features that help you find people in very specific niches who are likely to increase your reach. Here we’ll find niche influencers to collaborate with by filtering and sorting in ways that aren’t possible with FollowerWonk or Twitter’s own search tools. Enter your topic and click search! It’s very useful to remove companies! Now you’re looking at a list of niche influencers complete with data about followings, retweet ratios, reply ratios. At a glance, you can see who is likely to interact on social media. But domain authority data is also here. A higher number means a bigger benefit to your search rankings if the blogger mentions you and links to your site from their blog. This report also gives you quick access to the content they’re sharing. Dig in and pick the influencers you like best, then you can add them to an outreach list for managing your contact and collaboration. Above and beyond this approach, our philosophy is always to be generous and helpful to anyone we connect with. Consider the advice of networking pro and friend, Dennis Shiao. “In parallel to the tools-based influencer discovery outlined in this post, make it an everyday habit to build authentic and meaningful relationships with influencers. Because I love to meet people, I engage in this sort of activity all the time. When doing so, I’m not thinking about benefits or results. I’m not thinking about “influencer outreach,” I’m thinking instead about “meeting people.” My motivation is to get to know someone new, someone I may learn from.” – Dennis Shiao, @dshiao, DNN Software. Once you’ve built a list of the key leaders in your niche, in a spreadsheet, a database or on paper, it’s time to plan your outreach. Tip! Ian Cleary of Outreachplus has a great in-depth article on how to find influencers. Salespeople have always known the value of a personal network. But marketers have been slow to catch on. It’s not about the size of your following, but the quality of your relationships. These are people who can truly help you. And they’re excited to help you. Why? Because you’re friends and you are just as motivated to help them. Help everyone you can and your marketing support network will grow. You’ll get more done, more efficiently and have more fun doing it. That’s really what influencer marketing is about. Try it! It will do wonders for the future of your business, career and personal life. 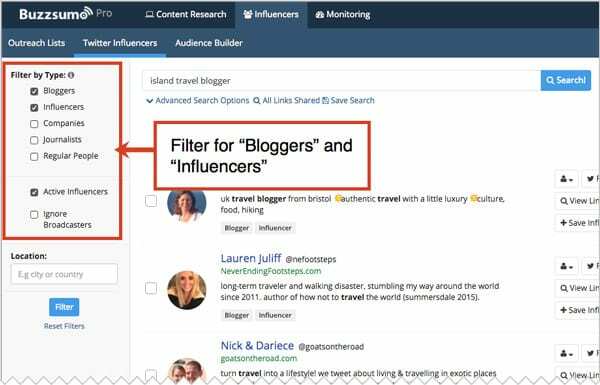 Another tool that I use to get a starting point on an influencers value is http://www.socialbluebook.com, it allows me to search for influencers and understand their value and also see key information about reach and engagement. I can choose to reach out to see if they are interested in doing a campaign, and manage all of that in the platform. They charge a transaction fee once a campaign is completed. I love your John Donne opening! More importantly, I agree with your point that influencer marketing is about building relationships. Even better take them into the real world. As a marketer, it’s key to examine not just what will look good for a fleeting moment on social media, but also what will resonate with your core audience. While many bloggers talk about traffic as their core reason for using influencer marketing, they overlook the staying power of long term relations. That goes beyond distributing one article. I can relate to that image… marketers throwing messages in bottles. You and I share the same philosophy about collaboration, networking and relationships. The best friends are friends you see offline, right? I cut out the middle man after spending 2 years of chasing influencers who wouldn’t let go of of the rice – so i declared myself the influencer in my niche and cut out the middle man – problem solved. 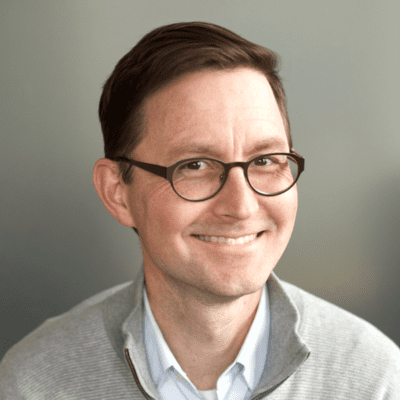 Andy – you know this approach has been successful for our clients. I use the Mozbar to determine domain authority and page authority when I’m looking at potential influencers – helps me cut to the chase very quickly and it’s free. Great article, Andy! I’m encouraged to see that interest in Influencer Marketing is on the rise as that’s my main promotion technique at the moment. 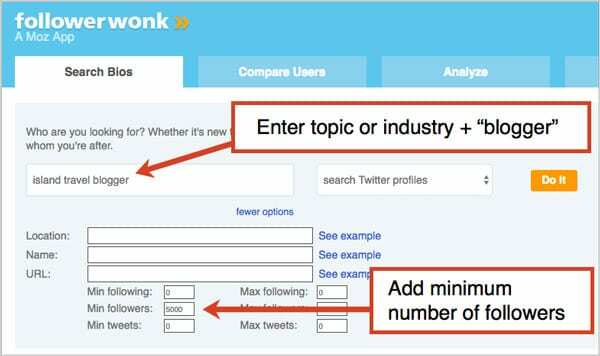 I’ll be having a look at Follower Wonk and Buzzsumo. The way I find Influencers for my roundup articles is to type into Google: experts share reveal secrets asked tips [+ niche keyword]. This search returns pages and pages of expert roundups. It’s a great technique because it not only finds Influencers, but it finds Influencers who like being included in roundups. Great work you’re doing! Very helpful post Andy! I was wondering, what social media platform do you think is best to use when reaching out to influencers? Awesome article, I liked it! Twitter is great for an influencers research, however, in some niches other platforms will work better (Like Pinterest for recipes) . Also, I found that “retweet ratios” is the most accurate metric to determine the influence. Heading off to tweet it now! Thanks, Andy for showing me the right way to search for influencers. “Is this person likely to work with me?” That’s a good one to consider because many people say they will but do not. Ironically, the greater the influence the more likely they will come through for you. The willingness to help explains how influencers have become influential.